Following the 7.8-magnitude earthquake which struck New Zealand’s South Island last week, scientists sent a drone to examine the damage left in its wake along the Kekerengu and Papatea fault line ruptures. The footage shows the extent of the damage caused, and is a sobering watch in light of the latest earthquakes that struck the country Tuesday. The North Island was hit with a 6.0-magnitude earthquake. The South Island also experienced a 5.3 quake a few hours later that may have been an aftershock from the previous week. The Kekerengu Fault is one of several to have ruptured during the Kaikoura earthquake on the South Island. Scientists estimate the surface rupture to be about 30km (19 miles) long. The videos were created by GNS Science, a geoscience research company. 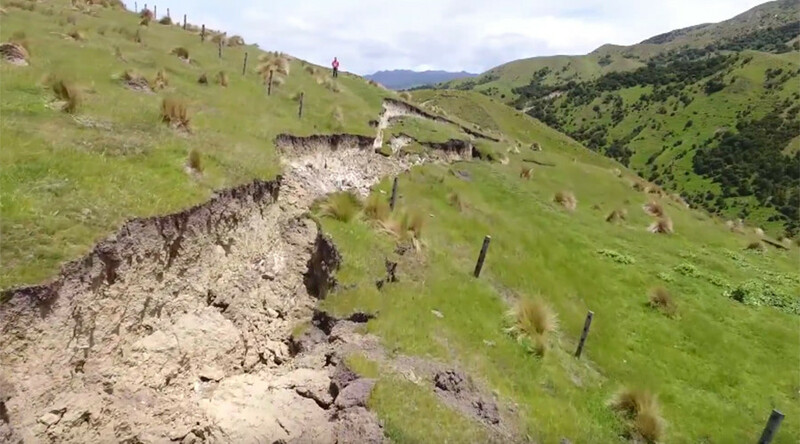 They sent a drone over both the Kekerengu Fault and the Papatea Fault in the northeast South Island with captivating results, highlighting the damage sustained as well as New Zealand’s beautiful landscapes. In some parts of the Kekerengu Fault, the earth moved 9 meters (30t) horizontally and 1.83 meters (6ft) vertically, GNS says. Drone footage from the Papatea Fault shows rocks that were pushed up from the seabed by the earthquake. An uplift of land on the coast has caused a small lagoon to form between the rocky uplift and the beach. In some places, a 6 meter shift of the seabed occurred. Both road and railway tracks have been damaged by the two and a half minute quake which killed two people and caused difficulties for many New Zealanders that were stranded after transport routes were damaged.